After taking Mario Tennis Aces out for a spin during last weekend’s limited beta, I’ve reached the definitive conclusion that the beloved sports franchise has turned into a fighting game like Street Fighter, Tekken, or Guilty Gear. Mario Tennis, which debuted as Mario’s Tennis on the Virtual Boy in 1995, started out as a fairly typical sports series. But as more installments were released, the Mario franchise’s idiosyncrasies slowly began to creep in. Mario Power Tennis for the GameCube added Power Shots in 2004, special moves that returned the ball with tremendous force after a short cutscene. 2005’s Mario Tennis: Power Tour on the GameBoy Advance added defensive Power Shots as well as tying them to an unseen meter that charged during matches. Mario Tennis Aces takes these concepts even further. The newest game features an on-screen energy gauge that can be filled by certain actions, such as extended rallies or the new Trick Shots, which are last-ditch maneuvers that allow players to track down errant shots. The game so strongly incentivizes Trick Shots that it’s often a good idea for to let a ball get behind you and then try a Trick Shot for a risky return in order to build meter. 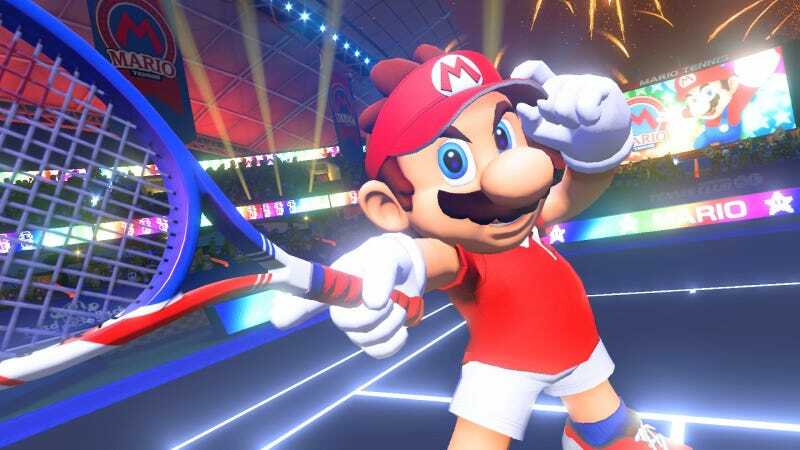 Mario Tennis Aces players can get access to a number of important moves by stockpiling certain resources. Zone Speed activates a slow-motion mode that essentially allows characters to move at super speed. Zone Shots put the player in a first-person mode where they can aim shots with pinpoint accuracy. And Special Shots are similar to the old Power Shots by activating a short cutscene and automatically returning any ball with devastating force. In addition to their increased speed and accuracy, Zone and Special Shots tie into another new Mario Tennis Aces mechanic: racket health. Both players are given three rackets that can be damaged over the course of a match through deliberate targeting by the opponent or otherwise mistimed returns. If all of these rackets are broken, the surviving player automatically wins the match no matter the current score, providing a separate avenue towards victory. It doesn’t take much of a leap to tie these systems—not to mention the typical reading and conditioning of opponents that is already present in tennis—to traditional fighting game mechanics, and many community members did so over the weekend. The energy gauge is a direct analogue to the meter used by games like Street Fighter and Guilty Gear, and Special Shots draw easy comparison to the cinematic super moves that have been a staple of the fighting genre for years. Racket health is the biggest game-changer. For the first time since its arrival in 2000, there’s a way to win a Mario Tennis match without winning the most points. Building a strategy around around damaging your opponent adds an entirely new dimension to Aces. On the offensive side, attackers have to weigh the benefits of disregarding an easy point for a returnable assault on the opponent, while defenders need to learn the intricate timing for countering these super shots. Mario Tennis Aces is the latest in a long line of non-fighting games to stumble into the fighting game community. Catherine, a one-on-one block-building game, is a regular sight at events. Similarly, the puzzle crossover Puyo Puyo Tetris has carved out its own niche thanks to an intense versus mode. While none of these are fighting games in a conventional sense, their unique incorporation of genre-prevalent strategies like neutral, footsies, mixups, and more make them an easy fit for the all-inclusive competitive scene. So while Mario Tennis Aces is, at its core, a tennis game, its various bells and whistles add up to a release that feels like a fighting game, and sometimes that’s all that matters. Correction 6/6/18, 1:19 PM: This article originally stated that Mario Tennis debuted on the Nintendo 64 in 2000. Mario’s Tennis on the Virtual Boy was released in 1995.